I am so glad to be able to attend Knit Night regularly again! How amazing are these women? I had such a good time visiting with everyone and checking out their WIPs that I hardly knit at all. I did shop, though! If you're in the neighborhood, be sure to grab a new Bamboo Sisterhood 3/4 sleeve t-shirt - I got my asphalt one last night with red and silver printing and am wearing it today. My colleagues remarked upon my fantastic rock 'n' roll appearance today. Ha! My destashed KSH in Heavenly arrived yesterday in the mail. It is a heavenly shade of blue. What will I do with it? You mean, besides pet and look at it? No idea yet, but I couldn't pass it up. Oh, and the Schaeffer yarn? It is Nancy, not Elaine. Did I get that right? It doesn't really matter. The bumpy yarn (both worsted and bulky weights) is great! I need to wash that swatch, so I can figure out that sweater. Deep smit. Why would anyone knit with yarn other than Malabrigo? Lime was right when she said that it cures eczema. It is the wonder yarn. Soooo soft. And the Little Lovely colorway is just beautiful. I scored a skein at Windsor Button Friday as the snow storm got underway and turned it into some garter gloves, since my Sheep 1 pair were lost in the dog recovery adventures at the end of January. Can you believe I've been wearing store-bought gloves for the past six weeks?!? Crazy. Anyway, I whipped up those gloves this weekend and started a matching cowl/collar thingy with the leftovers last night. I have Purl scarf in this yarn from last winter, but it hasn't aged well, so I need something else. If I have any leftover leftovers, I think I may knit a flower to put on my Blizzard hat. Of course the only problem with softly-spun, single-ply Malabrigo is that it pills like no one's beeswax. But pulling pills gives you something to do when you can't knit! I also finished up the little Lala Scarf from Greetings from Knit Cafe. Only problem is I, apparently, am the world's tightest crocheter. The shawlette is supposed to end up approximately 14 x 33", but, after I crocheted along the top edge, it was more like 14 x 14". So, yes, I frogged mohair last night. Ugh. I have two choices (well, three - the third to be to just leave it as is): Redo the crochet edge but try to do so loosely (I had even gone up a hook size, since it was all I had on-hand) or pick up/knit/bind off the edge. Thoughts? N.B. While the pattern for the Lala Scarf calls for three skeins of yarn, I barely put a dent in any of them. Which means leftover KSH! Yippeee! Oh, that picot bindoff is sort of a pain but ends up just so pretty. Worth it. I seem to be on a shrug or small sweater kick at the moment. Perhaps it's an instant gratification thing. Or a sign of spring that I don't need to be completely covered in wool. Except perhaps for the Schaeffer Elaine. Man, that's some soft Merino. But we won't be working on that one until the Sheep 3 Shrug is finished. It really should be called a mini-cardi, since it has sleeves and a separate waistband and sides in the front. Anyway, I had to frog the ribbing on the bottom of the sweater, since it stopped about mid-bust. I added another inch of stockinette last night and started the ribbing again. I'm getting close to the end of the skein but figure finishing the armholes will take only two smidges of yarn, so I should make it. It's just that this is one skein (again with the one-skein wonders), and I'm loathe to cut it. I know: wimp. Anyway, the yarn is awesome. Can't wait until it's really available. With a little tinking I ended up doing the Reading-in-bed Shrug in one skein of Brushed Suri. I ended up with about 8" left over. Eep! Oh, and two rows less of ribbing on one armhole. But with this fluffy yarn, you can't tell. What a great little shrug! Just the right amount of cosy. So, now I have this other skein of Brushed Suri. Options are to swap it for another shade and make another one of these for myself. Or as a gift. Or exchange it for something else. Or ... ? Well, maybe just pet it. But that yarn is even better knit up. I don't think YITF has the Earl Grey color in stock, which looks very pretty. Whipped Cream would be yummy, as would Toasted Marshmallow or Lollipop. I'm getting hungry. Spring lambs! Hope to see you there! * Join Drumlin Farm for a day to celebrate sheep with fiber crafters, food, and fun! There's something for everyone at this one-of-a-kind event. * Kids will love visiting our resident sheep and our cute-as-can-be new spring lambs, the stars of the show. * Visit the Sheep to Sweater interpretive trail for hands-on experiences with wool. Try your hands at all stages of wool production including carding, spinning, felting, and dyeing. You'll literally follow the wool from sheep to product! * Purchase beautiful hand made natural fiber products from local crafters-cashmere scarves, wool sweaters, and much more. And you won't want to leave without a visit to the country store for natural Drumlin Farm-made products like goat's milk soap and yarn from our sheep. * See live sheep shearing, and watch border collies herd sheep. * Sample delicious all natural, locally-grown and harvested Drumlin Farm food. * Bask in the beauty of Drumlin Farm, the perfect setting to celebrate the coming of spring. Visit www.massaudubon.org/drumlin for more information. Call 781.259.2206 for tickets. Events run rain or shine, tickets are non-refundable. Your ticket price provides critical support for our education and conservation programs. No, not a scarf for my beloved Miss Isobel, but a lacey scarf named Isobel. I just found it here as I was wondering what to do with one skein of Misti Alpaca laceweight yarn or some of the other lacey fibers I have in the stash. I have to organize the stash so I know what I have. Anyway, this is very pretty and may be a good next lace project. Some day I will knit one of those amazing from the center out circle shawls where every row is different just to have done it. I am crazy. OK, close your eyes and think of a cosy place filled with yummy fibers (many of which are hand-dyed), handmade buttons, tea and treats, comfy couches, and two super-friendly owners. Put it in a former antique/flower/sweet shop with a mural of angels behind the counter. Add friendly shoppers, great music, and a new art show every few months. And you've got yourself the best little yarn shop around. Oh, don't forget to put a little kids table in the corner with markers, paper, and toys. No, they don't have every colorway of every yarn you've ever heard of, but that's not really the point here. They do have GGH, Blue Sky Alpacas, Jo Sharp, Noro, Blue Heron, Green Mountain Spinnery, Cherry Tree Hill, Sheep Shop (#3 is coming any day! ), Frog Tree, Reynolds, Louet, Schaeffer, Reynolds, and more; needles and notions from Bryspun, Susan Bates, and Addi (Turbo and Natura, not sure about the lace needles). They also have a thoughtful selection of books and patterns to get you started on anything. They even have some lovely rugs and toys from Crispina, which are made from recycled sweaters. But the truly wonderful thing about Yarns in the Farms is the people. Carolyn and Jill are just about the nicest people you could find and they have made a truly inviting shop. It seems Carolyn may be allergic to wool, so she's starting to work with a lot of "alternative" fibers. Of course, they have a new shipment of No Sheep for You, Tofutsies, and Euroflax. Jill is an artist, and you can see some of her amazing needle felting projects around the shop. I've included pictures from a Knit Night a couple of months back, but you really need to come see for yourself. You could even take the Commuter Rail up to the Pride's Crossing station and walk over. However you get yourself there, do stop by. Have you seen this hat? It's retailing for $100. Amazing. 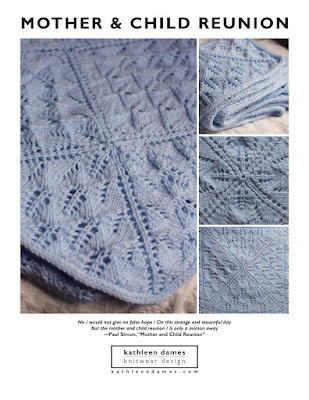 Seeing The Daily Purl's Icarus is pushing me towards selecting this pattern for my first lace shawl. Now the debate becomes buy the back issue of Interweave Knits or the pattern from Miriam Felton directly. There's not a whole lot else in that issue of the magazine that's calling to me. The Fairy Net Blouse is pretty, but I may be Blue Sky Alpaca Silk'ed out by the time I finish the Mermaid Sweater. If I buy it directly from Miriam, I would be supporting her directly (she was already paid by the magazine directly, so she wouldn't get anything else out of my mag purchase), and it looks like she offers full pattern support in return. Guess I'm leaning towards direct purchase. But that will happen later. Yes, btw, I do have a job and should get back to it! Sooo, the Sylvan Spirit is DK. If I did it on US5s, it might just work. Yarns in the Farms has an elegant toffee shade of Steadfast Fibers's Marvelous Mohair on sale, and I may need to make myself one of these. It would be lovely in other colors, too, of course. It's here! Some very nice projects. Isobel and I stopped by Yarns in the Farms on our way home yesterday to say "hi! ", since I wouldn't be able to attend Knit Night with Peter being back (Isobel was very excited for him to come home, by the way - "Yay!" and hand-clapping when I told her we were going to the airport to pick him up). While there I helped a woman make color choices for a felted bag along the lines of the diaper bag in Knitting for Baby that she was going to have her mother knit for her. We ended up with a lovely combination of deep olive green (F29), some light green (F31), and a skein of a beautiful, springy, variegated yarn (G123) in Sheep 2. Anyway, I realized that I could do the Capecho in Green Mountain Spinnery's Sylvan Spirit, a merino/tencel blend. I have two skeins of Luminosity (when that yarn came in the shop, I went gaga) already and would probably need only three more. I think the tencel, which gives an amazing pearly sheen to the stitches, according toClara, would give a wonderful effect and enhance stitch definition. I'll have to give it a swatch. Speaking of swatches, I wound up a skein of Schaeffer Elaine the other night. It overflowed the ballwinder, being 600 yards, and I had to wind up the rest of it by hand. I guess I could have pulled the cake off the winder and then started from the other end of yarn left on the swift to make two cakes, but it was kind of fun to actually wind some of the yarn by hand. Man, is that stuff soft! It's also finer than it may appear in the skein. I started swatching with US8s and immediately found the stitches too open with the thin parts of the yarn. The US7 swatch is better and probably what I'll use, though I may do a quick swatch on US6s to see what that would look like. Stockinette is fine in this yarn, but I think garter or reverse stockinette really shows off the bumpiness, so I am planning to go top-down in the round and then turn the whole thing inside-out a la Wendy's Last-Minute Purled Beret. I've made some more progress on the Sheep 3 Shrug but am really keen on something woolly with all this super-cold weather. I had hoped to do the Jane Addams sweater on a larger needle so it would go faster, but I'll just knit as fast as I can! Hopefully, this will be the last of the SABLE stuff until I'm able to knit the stash down a bit. My Rockin' Sock Club kit arrived yesterday. Squee! The yarn is beautiful and a colorway I wouldn't have chosen myself. You can really see how it will work in the reskeined Emergency Sock Yarn skein. How cute! I didn't even have time to read through everything in my binder last night, but I did put my Rockin' Sock Club pin (looks like the colorway on the pin is Rhodonite)on my knitting bag, which is bright pink. The reason for the lack of reading? More progress on the Sheep 3 shrug. Sheep 3 is a gorgeous yarn! The silk gives it the most amazing shimmer. And I'm a sucker for anything shimmery or sparkly. Ask anyone. And, of course, I'm in love with this turquoise, variegated colorway. The hand of the yarn is a little dry, almost crisp, when knitting, due to the silk, I guess. But the finished knitting is soft and lovely. Can't wait to finish this one. As for the Capecho yarn decision? Bridget is absolutely no help! Thanks a lot. Hehe. I'm tabling the decision for a little while but will keep you posted.